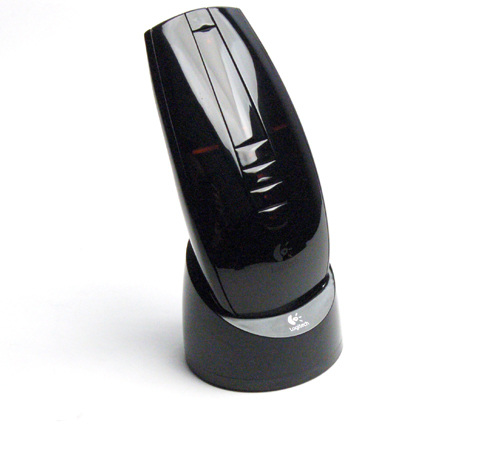 Bid farewell to changing batteries with the MX Air Mouse's recharging station. A definite eye candy with its sleek and stealthy design. Be the master navigator, with Logitech's patented Freespace motion control technology. Take a trip down nostalgia lane and try to recall how your first mouse looked. Now, take a glance at the Logitech MX Air Mouse and we believe your first thought would be similar to ours. It is one of awe, at the beauty of its exterior design. For the MX Air Mouse, the beauty is not only skin deep, it goes into the very core of its programming, as we will show you soon. As technology races onward, being innovative is no longer sufficient to impress the discerning consumer. To attract the ever fashionable user, Logitech has the foresight to design its latest wireless mouse with a sleek and stealthy look. 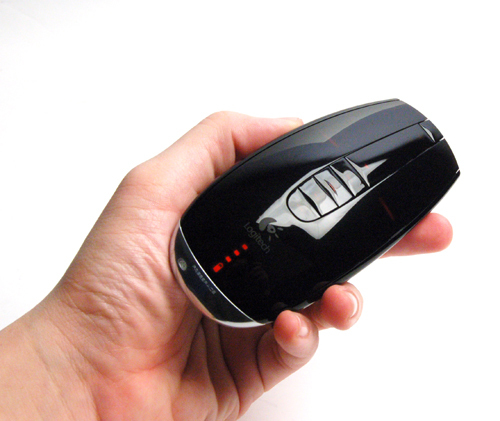 From our first touch, we were amazed by its light and slim feel, unlike most other mice. Stealth would be an apt descriptor for the MX Air Mouse. 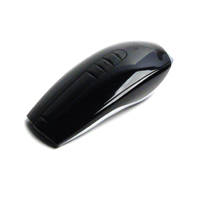 During modes of inactivity, the MX Air Mouse has a soothing and calming appearance due to its black and reflective body. Once in action, the orange backlight kicks in, lighting up the left and right mouse buttons, plus the four media control buttons, namely Back, Select, Play and Volume. 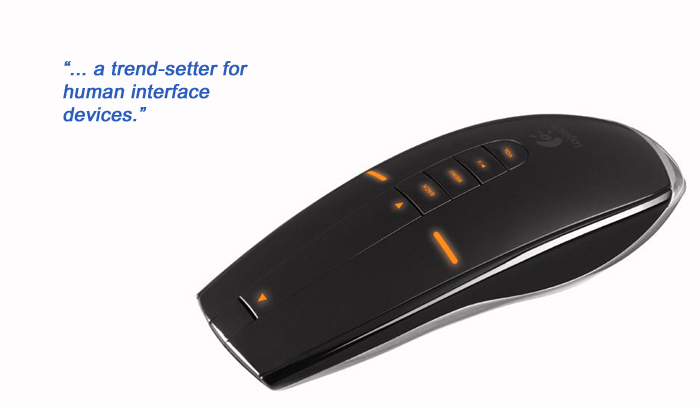 The scrolling wheel is replaced in favor of a touch motion scroll, much like Logitech's MX5000 desktop keyboard. A note to add: the scroll generates its own synthetic scrolling sound, which is a nice, if geeky touch. 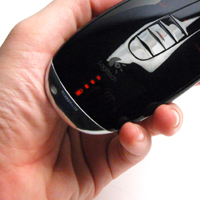 Mice were once bound by wires and gained freedom with radio transceivers. Now, with the MX Air, it is also no longer bound to the desk, thanks to Logitech's patented Freespace motion control technology. With the ability to detect three-directional motions and tremor cancellation for accuracy, the MX Air promises an aerial navigational experience like no other. 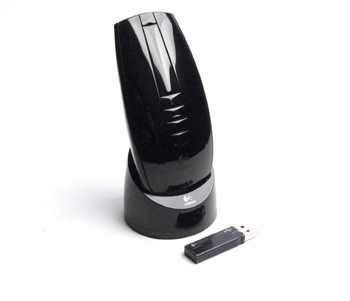 Installation of the mouse is as minimal as its design with its plug and play interface. With the recent introduction of Microsoft's Windows Vista, the MX Air is ready for the new operating system and works with the included media center application found in the Home Premium and Ultimate editions. To fully utilize its media playback capabilities however, installation of the accompanying software is required. With its full functionality unlocked, the MX Air is a formidable media player controller, allowing basic navigation with a slight hand gesture. By holding onto the Play button and rotating the MX Air in either a clockwise or anti-clockwise motion, users will be able to go to their next or previous media selection respectively. Likewise, by clicking on the Volume button and moving the MX Air either left or right in the air, a lower or higher volume is achieved respectively. The transition from desktop to aerial mode is established once the MX Air is lifted from the surface, and vice versa. 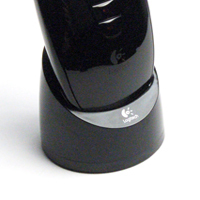 Ground control, as we’d like to call it, retains the smoothness and sensitivity one can expect from a Logitech product. Surprisingly, the aerial navigation felt much smoother than the desktop control. Obviously, for a perfect gaming experience, we can safely say that aerial navigation is not the way to go. The MX Air works with a built-in rechargeable lithium-ion battery, with a recharging station provisioned within the package. Our test showed that a full charge of 2.5 hours would guarantee an average of 5 days usage for most users. To promote an ideal power saving environment, the MX Air is also fitted with a power switch, located at the bottom of the nose. Its effective range reaches up to 30 feet (10 meters), making it suitable in a spacious conference room setting as a media controller. Giving users the option to lounge at ease by navigating the mouse in the air, or be in full focus with desktop navigation, the MX Air does hold itself well as a solo piece. With its futuristic design, complemented by its innovative Freespace motion control technology and its playback functionality, Logitech is on the right track as a trend-setter for human interface devices. The Logitech MX Air Mouse is tagged at a retail price of S$279, with an estimated release at the end of August.